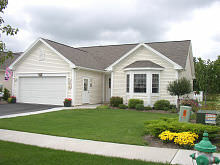 This charming country community in Clifton Springs, NY offers four quality constructed homes by Van Scott Builders. A selection of customizable patio home sites are currently available with access to the Ashton Place retirement community and activities. All homes feature ground floor master bedrooms and baths. No step front door entries. Fully dry walled and painted two car garage for multi-purpose use. Upgraded insulation in walls and ceilings for energy efficiency. Premium vinyl siding, premium low-E, insulated glass double hung windows, and 30 year warranty roof shingles for long lasting quality. Ashton Springs has partnered with Ashton Place, a highly regarded senior living complex neighboring Ashton Springs, to bring their services and amenities to Ashton Springs homeowners on an “a la carte” basis. Convenient access to the Village of Clifton Springs offers a variety of restaurants, services and shops that are within easy walking distance from Ashton Springs. An additional convenience is the shopping center plaza and grocery store that adjoins Patio Homes Ashton Springs to the north.